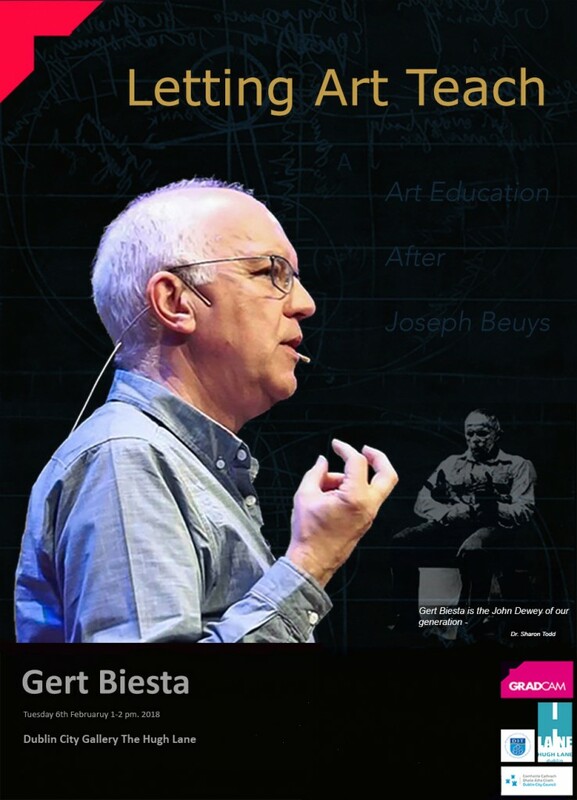 Gert Biesta is one of the most important theorists working in educational discourse today. In his key works; Beyond Learning (2016), Good education in the Age of Measurement (2010), The Beautiful Risk of Education (2014), he has defended the unique value of education against its economic rationalization through the ‘language of learning’. Most recently Prof. Biesta has turned his attention to art education with the publication of Letting Art Teach: Art Education After Joseph Beuys (2017) which explores the various ways that art and education are instrumentalised in educational discourse and policy. For Biesta, the teaching of art should enable students to have a unique dialogue with the world. Replacing the over-emphasis on ‘student-centered’ learning with a call for ‘world-centered’ education, Biesta affirms the value of art and teaching as an ‘event’ that opens up spaces for the student to be addressed by the world, and in turn, to address the world back. Letting Art Teach at the Hugh lane Gallery on the 6th Feb will expand on the ideas developed in Letting Art Teach. Education After Joseph Beuys (2017). To enable a broader discussion on these ideas three art educators from three different art institutions have been invited to respond to the presentation, they are: Dr. Brian Fay (DIT), Prof. Brian Hand (NCAD), Dr. Tina Kinsella (IADT). The discussion will be chaired by Dr. Sharon Todd (Maynooth University). Gert Biesta is Professor of Education in the Department of Education of Brunel University London (0.8) and Visiting Professor (Professor II) at NLA University College, Bergen, Norway. Since April 2016 he has held the NIVOZ Professorship for Education at the University for Humanistic Studies, the Netherlands (0.2). Before this he worked at universities in Luxembourg, Scotland (University of Stirling), England (University of Exeter), and the Netherlands (Utrecht, Leiden and Groningen) and held Visiting Professorships at the University of Orebro, Sweden, Malardalen University, Sweden, and ArtEZ Institute of the Arts, the Netherlands. He is a former Spencer Post-Doctoral Fellow with the National Academy of Education, USA. In January 2015 he became an associate member of the ‘Onderwijsraad’ (the Education Council of the Netherlands) for the period 2015-2018. The ‘Onderwijsraad’ is the main government advisory body on education (see here for more information). Since April 2016 he was also scientific advisor to VERUS in the Netherlands. He is joint-coordinator of SIG 25 (Educational Theory) of EARLI, The European Association for Research and Learning and Instruction, together with Rupert Wegerif and Giuseppe Ritella (JURE Assistant Coordinator). For more information click here. Gert is currently co-editor of two book-series with Routledge: New Directions in the Philosophy of Education (with Michael A. Peters) and Theorizing Education (with Julie Allan and Richard Edwards).